Springtime on the prairie, and birds are revving up! At a display area, known as a lek, the male Greater Sage-Grouse perform for mating rights, while the smaller females look on. Today, the Greater Sage-Grouse is seriously endangered, its fate intertwined with the loss of sage habitat. Millions of acres have been converted to cropland, and on millions more, the sage has been removed. You can learn more about the challenges of the grouse at StateOfTheBirds.org, and about conservation efforts at Pheasantsforever.org. Dawn breaks across the sagebrush country of the West on a brisk March morning. And we can now see the Sage-Grouse clearly. The enormous males are over two feet long, and weigh six pounds. They stand bolt upright, their long tails fanned like a turkey’s tail, the dark backs and bellies contrasting sharply with their white breasts. 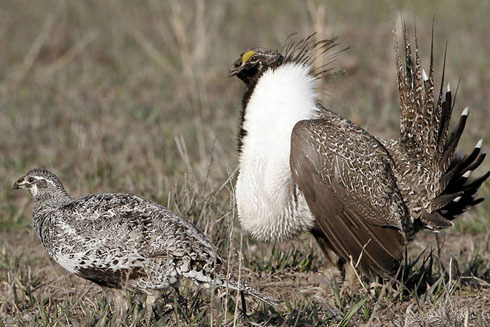 As lands formerly covered in sage are converted to agriculture, so goes the fate of the magnificent sage-grouse. In some areas, the grouse have less than ten percent of their historical range. Today's show brought to you by the Lufkin Family Foundation.